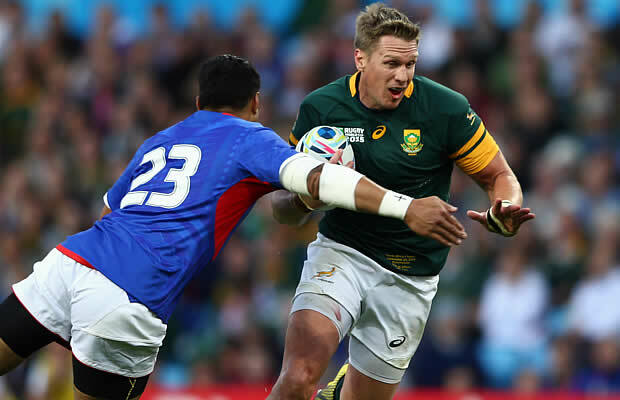 South Africa could lose their injury prone captain Jean de Villiers World Cup for the rest of the tournament after he was rushed to hospital with a broken jaw. De Villiers has only recently returned from a broken jaw suffered in the Rugby Championship and it now appears that he has broken his jaw for the second time in months. South Africa won the match 46-6 and they now top their Pool despite their loss to Japan. The 34-year-old centre – who missed the 2003 World Cup because of a serious knee injury and the 2007 final triumph when he was injured in the opening pool game — came off during the second-half in Birmingham but had to rejoin the fray for the final few minutes. “Jean is going for X-rays,” said coach Heyneke Meyer. De Villiers barely made the World Cup after returning from a long lay-off from a serious knee injury suffered against Wales in November. On his next return he broke his jaw playing in South Africa’s first defeat by Argentina in August in Durban. His performance in that game was much criticised but Meyer stuck with de Villiers as World Cup skipper. He again remained loyal after the stunning 34-32 defeat by Japan last Saturday. Adding to Meyer’s concerns are other Springboks hurt in the clash with the physically challenging Samoans. Lock Eben Etzebeth also went to hospital for x-rays. Centres Damian de Allende and Jesse Kriel also went off — de Villiers having to replace the latter whose face bore several bruises. Both will be inspected by the team doctor on Sunday. “There is a long list of injuries and we will release it as soon as the doc has had a look at it,” said Meyer. South Africa’s next game is another tough encounter against Scotland next Sunday in Newcastle.